Heather Ács’ “what the brain forgets and the heart denies, the body remembers…” explores illness, death, grieving and loss refracted through working class Appalachian and Mexican cultural imagery, creating a nonlinear world layered with movement, gesture, storytelling, soundscape, video, and installation. In this multi-media solo performance piece, time and testimonies loop, break apart, burrow, reemerge, and cross over. Breath taking, glass breaking, gifts are bestowed. Sparrows descend, tortillas and tears sizzle on the comal, a river flows with dirt and glitter. Lesley Gore croons cotton candy lyrics laced with razor blades while dust gathers in an empty house. Stitch it all together with string theory and skeleton keys, stuff into a mason jar, shake until your heart might break, check your pulse, make a wish, and see what rises to the surface. 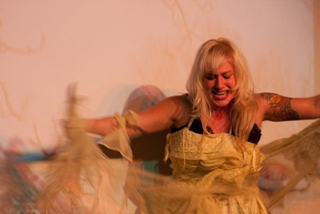 “…the body remembers” premiered in New York City and has been featured at theatres, galleries, colleges/universities and community spaces across the U.S., Canada and Europe as part of the “Tragic Magic” tour, “How to Build a Fire” Teaching Artist tour, and the “Heels on Wheels Glitter Roadshow”.